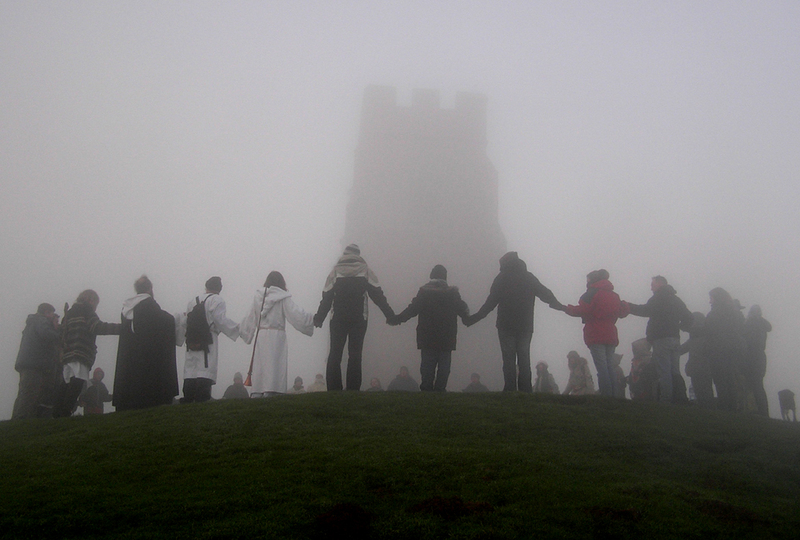 22nd December 2006 - the weather is cold and very foggy as we begin our climb up the Glastonbury Tor, ready to welcome the Winter solstice sunrise. You could not make out the silhouette of the tower until we reached the very top of the Tor. The fog swirled around us and the usual magnificent view over Glastonbury was nowhere to be seen. Our gathering grew as dawn approached. There was singing, drumming, trumpeting, a circle celebration and drinking of celebratory mead as we all celebrated the return of the sun and longer days from now on - but the sun remained hidden in the fog! The solstice circle join hands and welcome the sun. It's a foggy winter solstice on the Tor this year. The Glastonbury tower is dated around the 14th Century, and the cave beneath the Tor was believed to be used by hermits since the 7th Century. The Glastonbury Tor can be seen from miles around, and there is usually a magnificent view - not this morning! Singing, dancing and drumming to celebrate the arrival of the winter solstice - it helps to keep warm too - it's freezing! Archaeologists made a surprise discovery at the foot of Silbury Hill in Wiltshire, part of the Avebury World Heritage Site - remains of a Roman settlement. The hill is the largest prehistoric structure in Europe, 37 metres high with a flat top 30m in diameter and nearly 5,000 years old. The Roman road, that is now the A4, changed its usual straight route to go around Silbury Hill, proving that the Romans recognised the prehistoric man-made mound. English Heritage scientists were carrying out a geo-physical survey before restoration work to stabilise the hill begins. The new data shows a village-sized settlement, consisting of streets and houses, the size of around 24 football pitches. The scientific team used caesium magnetometers which pick up magnetic disturbances in the soil, up to 1.5 metres deep. It has been suggested by experts that Silbury Hill might have been a stop-over point for Roman travellers on their way to Bath to take the waters. It is also likely that the Romans would have been drawn to the sacred setting of a prehistoric site near to water - Winterbourne River and the Swallowhead Spring are close by. Long, long ago in the town of Devizes, people began to speak ill of the devil, so hearing of this he went to the town intending to dump a huge bag of earth on them all. The people luckily heard about this and so sent their bravest man to meet Lucifer. He carried with him a big bag full of worn old shoes, and he tried to convince the devil that he had worn out all these shoes walking from Devizes (when in truth it was only 5 miles away!) The devil, already tired of walking, couldn't face the prospect of walking much further, so dumped his huge pile of earth where he stood. This is why Silbury hill is where it is today! There are many different versions of this tale, such as : the devil was angry with Devizes because they had turned to Christianity, and that the brave man who went to meet the devil, told him that when he had started his journey from Devizes he was a young boy. 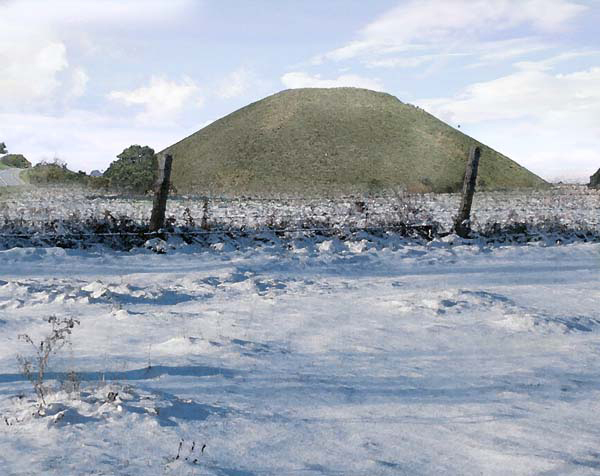 The purpose of Silbury Hill remains a mystery. Was it perhaps a viewing or signalling platform? No burials have ever been found inside the hill. 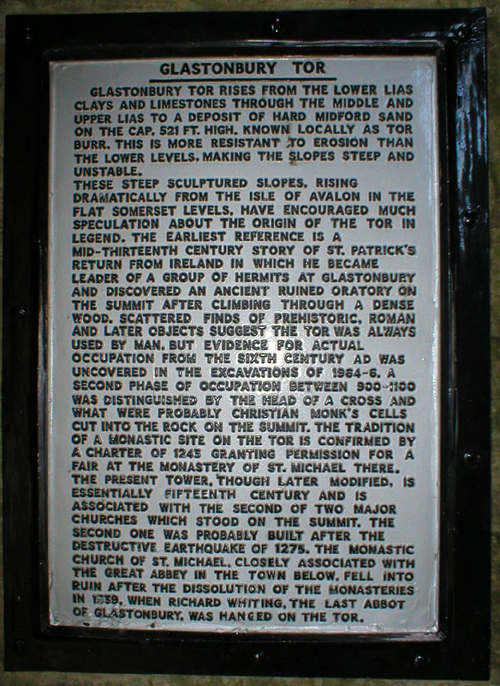 The mound was used as a fortification during 11th and 12th Centuries, which is when the terrace was made.